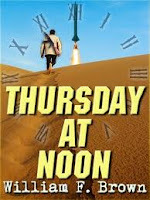 Thursday at Noon is one of three books written by William F. Brown, along with Amongst My Enemies and The Undertaker. While the action-packed thriller/suspense kind of story isn't my usual thing, I agreed to read the book and discuss it here. Actually he had emailed me back when I was in the middle of trying to read through this year's Booker Prize longlist when I really didn't have the time to read much of anything, so it got put on the back burner until a recent email nudge reminded me that I said I'd give it a go. A promise is a promise, so over Christmas, while sitting on a hotel balcony overlooking the Gulf of Mexico, I pulled out my kindle and got going on it. Set in 1962, CIA agent Richard Thomson has recently arrived in Egypt after having screwed up bigtime in an operation in Damascus. He's sort of persona non grata in Cairo at the moment, so he spends a lot of time in a bar drowning his sorrows. One night while downing the booze he's approached by an Egyptian guy who has something to sell him. It seems that this stranger was told to find help from another CIA agent, but the instructions never said how to locate him. Anyway, the man has an envelope filled with photos that he tries to sell to Thomson, who, suspecting a set up after his poor showing in Damascus, refuses to have anything to do with the guy. The other man is frantic and highly agitated, and it isn't long until he is found dead. Now the police get involved, as does Egyptian state security and Thomson finds himself embroiled in in a nightmarish situation. When he starts putting two and two together and figures out that something really bad is going on, no one believes him -- not his fellow agents, not the ambassador, and especially not the police. It is up to Thomson to try and stop a catastrophe that could affect the entire world. He has until Thursday at noon -- and time is running out. There is truly never a dull moment in this novel, and the book is aimed at an audience of readers inclined toward the "what if" fast-paced, explosive political thriller/conspiracy genre. I had to finish it to see what happens, and for a lazy day of reading it was easy to get caught up in the story. The premise is different and considering that it was set in 1962, with a few changes it might be set in our modern-day world, making it approachable to today's readers. It also expresses the animosity felt by many living under the thumb of their British colonial minders prior to Egypt's independence; a point the author captures very well. He's also established and evoked a realistic sense of time and place. At the same time, it has more than its share of over-the-top moments -- Nazi scientists, the SS and an improbable love affair are but a few that really made me do the inner eye roll -- which spill over the floodgates of anything remotely resembling credulity, so prepare to suspend any measure of disbelief while you're reading it. But I suppose that's the nature of the beast in these types of books and maybe what makes them sell so well. I also wonder if we really need any more books about wayward Muslim brotherhoods and nationalist fanatics right now. While it's an easy way to spend a day, and while I was engaged and had to know what else could possibly happen to this poor guy, it was a little too over the top for my taste, especially incorporating the Nazis and the SS. I get why the author did this, but it's asking way too much. To be very fair, I think I'm just not the right audience for this book. However, people who are fans of this genre will probably really like it -- it has pretty much every kind of bad guy there is, lots of action and the inevitable hapless, Cassandra-like character who knows what's coming and can't get anyone to believe him. It's a definite roller-coaster ride that should keep thriller fans entertained. Nancy - I'm not normally a conspiracy-thriller person either, so I know what you mean. But it does sound as though there's plenty of action here. Thanks for your honest and thorough review. It's so difficult when I realize I probably am not the right audience for a book. I think my husband would like it, though!